If you recognize these quotes, then you’ve experienced L.A. traffic. These quotes are just a small sampling of what is said about driving in the legendary city. 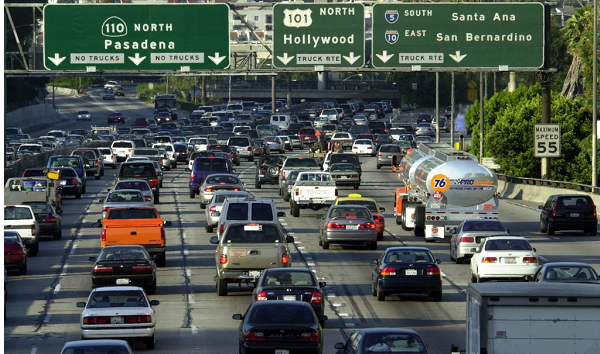 Every major publication in the U.S. and abroad has had something to say about L.A. traffic. Forbes, Money, Travel, LA Times, Huffington Post, New York Times, and Trip Advisor – they’ve all chipped in their two cents. •	Residents of Los Angeles spend an average of 81-100 hours idling on freeways annually. •	On any given morning, drivers will creep at an average of 17mph during the 8am “rush” hour. •	Los Angeles is one of few cities in the world where automated vehicles (which are set to be released on a mass scale in the next 3 years), are going to make things worse, not better. 1. 101 Freeway between Topanga Canyon Blvd and Vignes St.
3. 10 Freeway between Santa Monica and Alameda St.
4. 101 Freeway between the 60 Freeway & Haskell Ave.
•	On any given day at 8am or 5pm, drivers will have to wait an average of 51 minutes in delayed traffic just to go 10-20 miles. •	Congestion costs the average L.A. driver just over $2400.00 per year. That equals 9.7 billion dollars city-wide. To put it into perspective, that’s roughly 3% of all the cities in the U.S.
Two contributing factors to how much traffic there is on the L.A. freeway within a given year is how strong the economy is in the Southern region of California as well as the rest of the country. For instance, if the job market and economy is strong and gas prices are low (as they have been over the past 3-5 years), then it’s a safe bet that the traffic could either double or triple. This is especially true during the summertime when tourism is at its peak. There’s no question that Southern California has experienced a huge boost in economic growth over the last half-decade. Thus, more single drivers and families are the on road. One of the greatest challenges L.A. traffic officials regularly face is figuring out how to exterminate the traffic situation throughout the metropolis. So far, past-presented solutions either didn’t fix the problem or created further ones. The idea of extending the Metro Rail out to congested areas failed. It presented its own set of challenges. Drivers who were used to commuting in their cars had a tough time transitioning from car to train. Currently, not enough Angelinos use the rail service to ease up the traffic congestion. In 2017, officials discussed passing a Traffic App law. It would require owners of L.A.-registered vehicles to install a traffic application hoping it would help drivers get to their destination without having to take the freeway. Although commuters would not necessarily benefit from the apps, those living in the congested areas may. Numerous tech ideas and alternate transportation models have been designed in the last couple of months. However, there seems to be no end in sight (pardon the pun), to the sheer frustration drivers are facing in their daily commute.